Earlier this month we held a free webinar hosted by Angie Taylor, Motion Graphic Designer, trainer and Adobe Evangelist. This engaging Webinar is packed full of the best tips and tricks for Production Premium CS6. Production Premium CS6 offers a sleek, fresh editing environment in Adobe Premiere Pro; 3D tracking and extruded text and shapes in Adobe After Effects; new Content-Aware tools in Adobe Photoshop Extended; and faster editing in Adobe Audition. Learn all about the new features of CS6 as well as new additions, Adobe Prelude for logging and ingest and Adobe SpeedGrade for color grading and finishing. You can view the webinar on demand now. To a fanfare of publicity Apple introduced the iPhone 5 this week. Sure, we know you can read about this just about everywhere at the moment, but we thought it might be interesting to highlight just how the video camera built-into the device compares with the handheld video cameras many of us began making movies with just a decade ago. Things have moved on. We took a look at Videomaker.com’s Best Products of the Year Awards 2001 to help illustrate this. We’re skipping the high-end cameras for the sake of this quick picture, but even there in terms of image capture quality, at least, the iPhone’s base stats seem fairly impressive. Interestingly the best DVD authoring system at the time (in the over-$4,000 category) was Apple’s PowerMac G4 with SuperDrive. Now we’re not arguing that iMovie on an iPhone can match the software we used for movie creation even at that time, but if you want to make a quick and dirty edit of recently captured footage, the things you can do on the device would never have been possible even then. 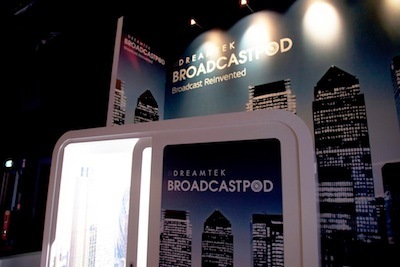 This week we’ve been at Europe’s biggest exhibition for broadcast and film professionals, IBC, introducing our all-new product for broadcasters of all kinds, Broadcastpod. The best way to think about this new offering is as a fully-equipped video broadcasting studio in a box. (That’s our booth at the show in the picture below).